Old Newton is one of those sprawling parishes which, despite having a definable village centre, spreads itself out into the fields with hamlets and farmsteads and isolated buildings. 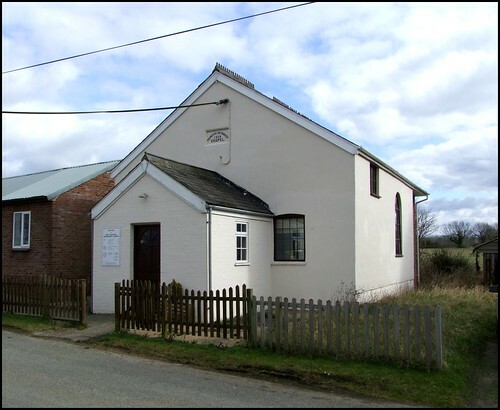 Out on the road to Gipping is pretty little Methodist chapel, originally built in 1839 and enlarged in 1907, and now with a large modern extension showing the busy life which still goes on here. 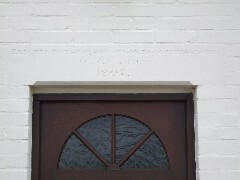 Interestingly, the 1907 extension has an inscription on it reading to commemorate the centenary, suggesting that the congregation here had worshipped in a different building before the construction of this one, probably in a private house, which would not be an unusual state of affairs. Rather curiously, the 1851 census of Religious Worship saw two entries submitted for this chapel. One came from William Howie Bull, the snooty new vicar of the nearby Anglican Parish Church, and there was another sent in, more correctly, on behalf of Mr Phillips, the Primitive Methodist Minister at Stowmarket, of which this was an outstation. Quite what the Reverend Bull thought he was doing submitting a return for the chapel I don't know: perhaps he misunderstood the rules, but this was the only case, in Suffolk at least, of a Minister submitting a return for a church which was not his. Perhaps it was to get in his defence in first: he wrote of his own church that it was quite full every Sunday afternoon without variation of consequence. But Mr Phillips showed that the chapel could hold its head up too: the 120 at the chapel afternoon service was barely a quarter of the extraordinary 400-odd at the parish church, but the combined attendance, out of a population of less than 800, meant that the percentage of residents attending church in Old Newton was probably the highest of any parish in all of Suffolk, where a figure of between a quarter and a third was more common. 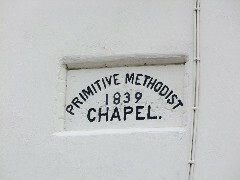 Methodist chapels are, of course, gathered congregations, so people may have travelled in from elsewhere. But the percentage of the parish population attending the Anglican church is extraordinary - more than half! This was not to be found anywhere else in Suffolk - if the Reverend Bull was telling the truth, of course.